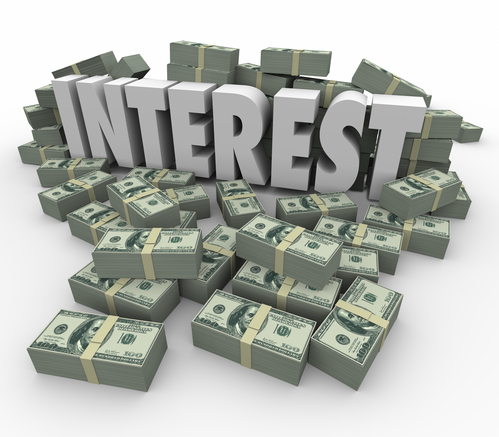 Why Are Half My Monthly Credit Card Payments Going Towards Interest? HomeBlog Credit Card DebtWhy Are Half My Monthly Credit Card Payments Going Towards Interest? If this is the case it’s because you’ve been carrying balances forward and making only your minimum credit card payments as the following video explains. As you saw in this video the problem is that you’ve fallen victim to the power of compound interest. The simple explanation of this is that the card issuer has added its interest charges to your principal (which is the amount you originally borrowed) so that your debt grows exponentially. Here’s a simple example of how compound interest works. If you owe $100 on a credit card at 10% interest you’ll be charged $10 the first month or 10% of the $100. With compound interest that $10 will be added to your original debt so that you now owe $110. The next month your credit card payment will include the $10 interest so that this now comes out to be $11 (110 x 0.10) so you now owe $121. As you can see from this example if you don’t pay off your balances in full each month you’ll be paying interest on your interest charges. And after a few years you’ll end up paying two times, three times, even four times or more what you originally borrowed – thanks to compound interest. You can also see how quickly debt can add up. This is why people who have multiple high interest credit card payments often end up turning to debt consolidation, debt relief programs or even bankruptcy. There are several reasons why people with an insurmountable amount of debt often end up turning to debt negotiation or what is usually called debt settlement. The number one of these reasons Is because debt settlement is the only way to actually get debts reduced Instead of just moved around. In fact, a good debt settlement company is often able to get its client’s debts reduced to a fraction of what is owed. Second, debt settlement represents a way to consolidate debts. This is because once you contract with a debt settlement company you’ll no longer be required to make those credit card payments. What you’ll do instead is send one payment a month to the settlement company, which should be for much less then the sum of the credit card payments you’ve been juggling. The settlement company will use this money to make lump some payments to your lenders to settle your debts. To completely settle a person’s debts typically takes from 24 to 48 months – depending on how much money they owe. While debt settlement will have a negative effect on your credit history it won’t be as severe as if you file for bankruptcy. A bankruptcy will leave a stain in your credit history that will last for 10 years. It will also make it virtually impossible for you to get new credit at a reasonable interest rate for at least two or maybe three years. Your insurance premiums will likely go up and the bankruptcy could even keep you from renting or buying a home. Just as important, a bankruptcy will stay in your personal file for the rest of your life. Anyone who accesses your personal history will see that you had a bankruptcy. Many employers now routinely check the credit histories of prospective employees so that a bankruptcy could actually keep you from getting a job. If you’re drowning in credit card debt with high interest charges, visit www.nationaldebtrelief.com to learn how to reduce your credit card debt without having to file for bankruptcy.